The future of home projection as arrived. The DILA engine is a revelation, especially with hi-def images. Simply stunning. Welcome to the future. The first Direct Drive Image Light Amplification (DILA) projector made specifically for the home, the DLA-HD1 from JVC, has hit the UK - and we're thrilled to report that it's a veritable revolution in high definition viewing at an astounding price. So, what's all the excitement about DILA? The dominance of LCD and DLP projectors is being put under pressure by two new challengers, both derived from Liquid Crystal on Silicon (LCOS) technology - SXRD (Sony) and DILA (JVC). The DILA engine in the DLA-HD1 claims an astounding 15000:1 native contrast ratio, which can be delivered without any iris-induced reduction in brightness, unlike the highest contrast levels of practically all rival LCD projectors. That's quite some claim to make, we're sure you'll agree with us. With the introduction of the DLA-HD1, JVC has gone for broke with a high-end projector that makes a visual statement, and only clocks in at around £4,500. It's bigger than we expected, though, and may well dominate a dedicated viewing room. Still, it's striking to look at, with its high-gloss finish and centrally positioned lens. Connectivity is suitably in tune with the high-definition age. There are two HDMI inputs (enough to keep Sky HD and PS3 owners occupied), component video input, and an RS-232 port, as well as the usual S-video and composite video back-ups (although we'll wager that they'll be seldom used). There's no VGA input for PCs, however. The DLA-HD1's specification is also striking. Firstly, its 1,920 x 1,080 native resolution hits the 'Full HD' bull's eye. Secondly, its aforementioned contrast ratio of 15000:1 is nothing short of mind-blowing. Brightness is 700 ANSI Lumens, and the DLA-HD1 is able to create a 100in image from a throw distance of 3m-6.08m, essential if you're planning to install this projector in a large-sized room. Befitting a fulsome-looking projector, the DLA-HD1 is jam-packed with neat features. JVC has reinvented its optical system to help the DLA-HD1 claim such an impressive specification. New smoothing technology has been introduced to the DILA engine to reduce light-spilling irregularities. Also on board is JVC's innovative Wire Grid Optical Engine, which crucially ensures less light leakage while showing dark scenes. Also featured here is Gennum's acclaimed GF9351 video processor. These technologies certainly strut their stuff when they are unleashed on a high-definition playing field - the picture performance that we managed to coax out of the DLA-HD1 is nothing short of masterful. Once we had set it up, which is easily done, and ready to roll, we cracked open our Blu-ray disc of Casino Royale, plonked it into our PS3 and sat back to enjoy the high-definition ride. Within seconds, it's clear that the DLA-HD1 has a licence to kill - all opposition at this price point. We were instantly struck by the quality of the black levels. Although previous DILA projectors have demonstrated a remarkable lack of video noise, and steered completely clear of the 'chicken wire' and 'rainbow effect' problems that can respectively blight LCD and DLP technology, black levels have been less impressive. It looks like all those technological tweaks that have gone into the make-up of the DLA-HD1 are starting to pay off, as blacks look incredibly rich without light leakage. It's hats off to the Wire Grid Optical Engine, then. High-definition pictures are also razor-sharp, as every pixel of visual information in the movie's busy gambling scenes is rendered with keen accuracy. Fine detailing is also excellent, made all the more satisfying by the total absence of video noise. You feel that you can count every grain of sand on the beach, during the scene where 007 emerges from the ocean, it's that detailed and realistic. Giving those remarkable black levels a run for their money is the DLA-HD1's natural way with colours. Also, it's an altogether more convincing performance than we've seen any other projector turn in with the movie's glamorous interior sequences and explosive action scenes. There's colour vibrancy without attendant gaudiness, and intensity on display that is beyond most of the DLA-HD1's competitors. Skin tones are superbly natural, thanks to an amazing contrast performance. It's rare when we're at a loss to find something negative to say about a shiny new hi-def toy, but today is categorically one of those days. 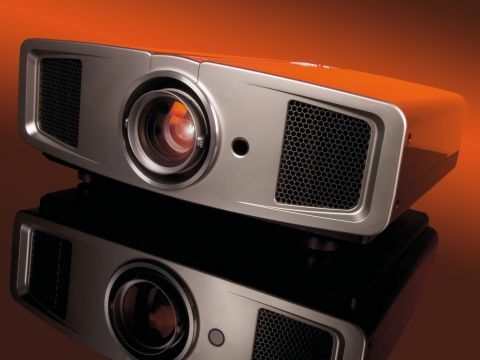 The JVC DLA-HD1 is the best projector we've had the pleasure to test for under £5,000 - hands down. It's feature-heavy, 1080p-capable, a serious picture performer and easy to use, thanks to a sleek and simple-to-navigate remote control. The 'Full HD' performance when in full flight is nothing less than a revelation. Simply put, the future of home projectors has arrived, and its name is the DLA-HD1.